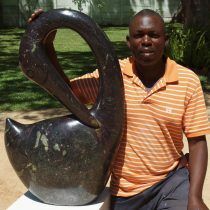 A very elegant pair of storks from Peter Chidzonga, with strikingly elegant and simple form, finished with his characteristic precision. Many bird species form long term partnerships, just as humans do. Pairs may stay together for many years. They perform dances together to reinforce their bond. The black shiny areas have been sanded, waxed and polished. Peter then achieves the feathered effect by stroking the surface of the sculpture with a blunt rasp. This abrasion lightens the surface of the stone, which then has the added benefit of making it an easy piece to light dramatically with a spotlight. Springstone is the local name for a very hard variety of serpentine stone. It is suitable for outdoor display, as it is dense and impermeable and has very few flaws that might be exacerbated by frost action. A piece of this size is suitable for indoor or outdoor display, it’s very versatile – or put the piece in the garden in the summer and bring it in in the winter. A quick wash with just water and a clean scrubbing brush will remove any dirt that has accumulated.